Dr Jengo's World: SDCC 2013 is here! The greatest toy and comic convention is finally here! As a collector of figures, I always look forward to this convention for the latest news on figure releases and licenses. This year is no different. I only collect video game stuff so not everything at the convention interests me but with more video-games doing transmedia these days, there is plenty of exciting news at SDCC. Well the show hasn't even started but there are plenty of news popping out already.. Some of it not directly from the convention but what better time to announce new stuff than now? Here are some of the news released this week.. Fans in North America have been waiting for a long time for this and it's finally here during SDCC 2013 week. I did secretly guess that it will be announced at this year's SDCC and I was right! As always, it's not comparable to the "Ultimate" AC IV Collector's Edition which is the Black Chest Edition. It does have the same figurine as the "2nd-tiered" Buccaneer Edition... or does it? On closer look, the flag is different. 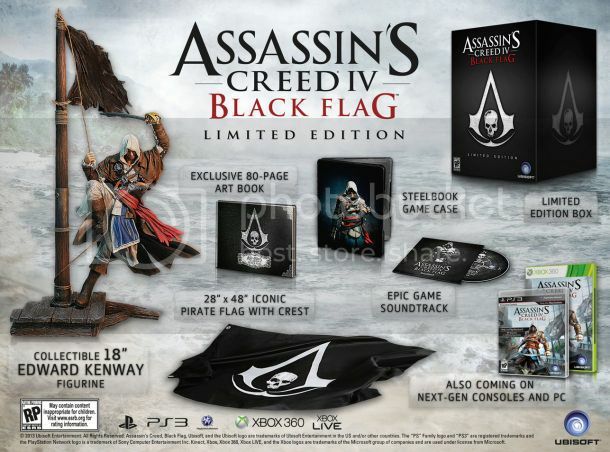 While this one doesn't have the AC IV Pirate Crest on it, the Buccaneer Edition has it. It is yet to be seen if there is an error in either ad or if they really are different variants. I'm hoping it's just an error.. the difference is too subtle to warrant another purchase..
Steelbook Collectors however, will be happy (or maybe not) to know the Steelbook Case included in this Edition is different from the EU editions. Another interesting to note is the choice of words.. Here we see a "Exclusive 80-Page Art Book" while the EU editions comes with an "Artbook". We also see a "Epic Game Soundtrack" here whereas the EU edition has a "Official Soundtrack". Wtf?! You NA folks need bombastic words to convince you or something? Then there is some Mortal Kombat for you Fatality-Lovers! Saw this on the Sideshow Freaks forum.. you cannot imagine how excited I got looking at this. It's very nicely done. The expression looks incredible! Details on his attire are incredible. Lots of articulation so you can pose him all kinds of ninja-action! The real selling point are the accessories though..
Are you thinking what I'm thinking? Fatalities man! They got the bloodied skull head and spine and what looks like a gory neck stump. 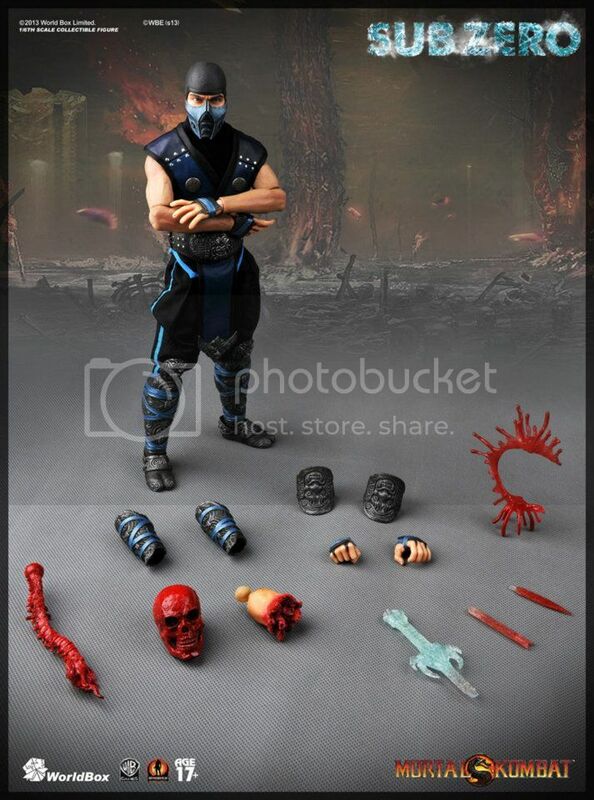 You can pose him in all your favourite fatalities! I'm really loving this. The extended fingers look a bit odd though and the mask looks a little too big but other than that, this is fantastic! You can check out all the other promo pics here. 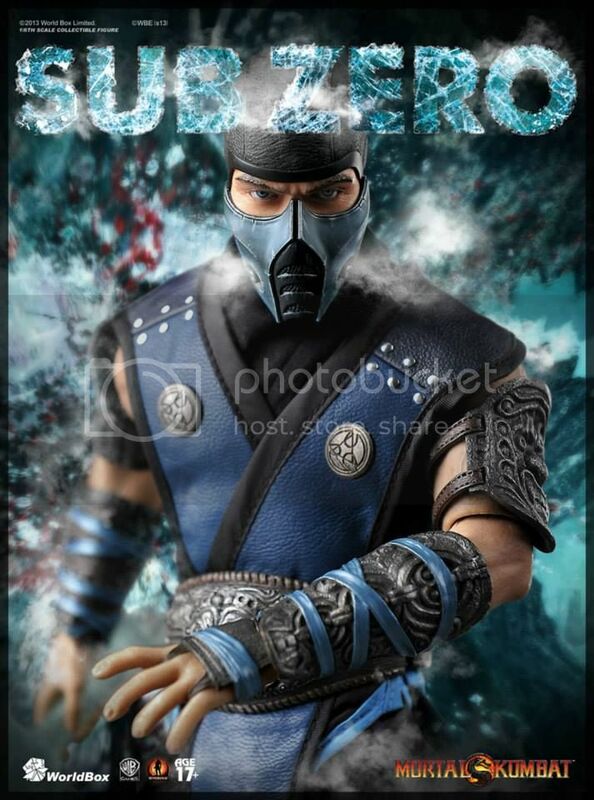 Definitely, there will be more MK news at the SDCC especially about Mortal Kombat Legacy Season 2, so stay tuned! Will be posting more interesting stuff from the convention as well!